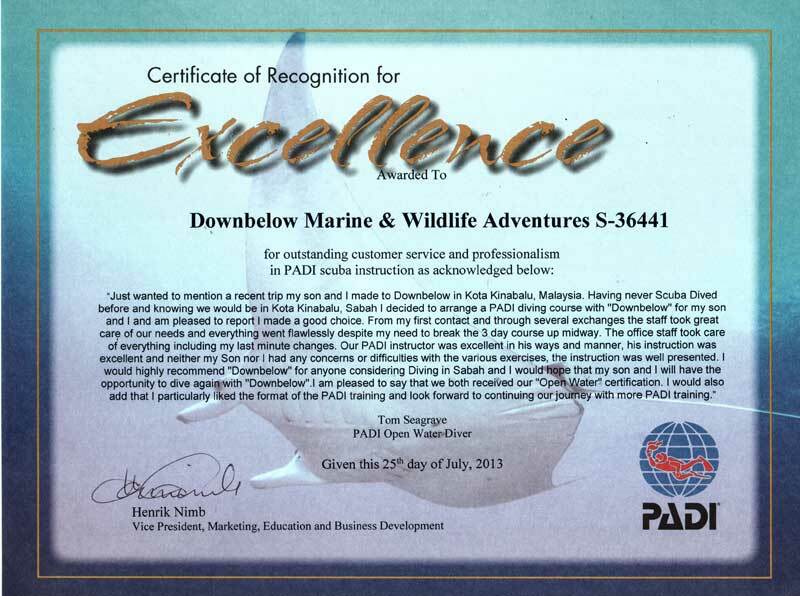 Learn to Scuba Dive in Borneo – Another Award of Excellence! Home/Guestbook, News/Learn to Scuba Dive in Borneo – Another Award of Excellence! It feels like awards season for us at Downbelow! Today we received another Certificate of Recognition for Excellence. This was the third such certificate for July alone. The first one was dated 1st of July 2013, the second one dated 17th July 2013 while this one was dated 25th July 2013. Thank you Tom and we look forward to when you and your son return to Borneo! Downbelow’s emphasis is on quality training and service, with low instructor to student ratios our clients receive the best of attention – always ! By Joanne Swann|2013-08-15T10:25:21+08:00August 15th, 2013|Guestbook, News|Comments Off on Learn to Scuba Dive in Borneo – Another Award of Excellence!